Free Timeshare Classified Ads - Sell , Rent or Exchange your Timeshare for free with TUG!! This page describes the features and enhancements of TUG's new Timeshare Classified Ad site called the Timeshare Marketplace! Free Timeshare Classified Ads from Timeshare Users Group! Welcome to the new TUG Timeshare Marketplace information page! This page will allow for easy navigation of all the new TUG classified ad features! Ok, enough advertising! now on to the program itself! I will now show you how to search for ads, browse all ads, and place new ads as well as define the individual types of ads for you and how to post each one in hopes to make this a much easier process for everyone! 1. What kinds of ads can you place for free? - Timeshare for sale Classified Ad - "you have a timeshare you want to sell to someone"
- Timeshare for rent Classified Ad - "you have a timeshare you want to rent to someone"
2. How to place a new ad! One of the most important features of the new ad program is the incredibly robust Timeshare Classified Ad search tool. This allows you to search for any number of charachteristics of a timeshare classified ad in order to narrow the search down to exactly what you are looking for. You can search for all timeshares in a specific location (example: hawaii) you can search for all timeshares of a specific resort developer (example: Marriott) you can search for any attribute of a timeshare (example: Number of bedrooms/bathrooms), and any combination each of them! None of the fields in this tool are mandatory, and you can select as many or as few as you want! Searching is 100% free and open to the public as we do not want to limit the number of potential views your timeshare ads will recieve. We have of course designed this system so that your email addresses do not show up anywhere on the ads themselves to greatly reduce the number of spamn/junk emails members used to recieve in the old system! We hope you enjoy! Search Timeshare Classified Ads Now! Since the "want to rent" and "want to buy" ads are so fundamentally different, they are stored in a completely separate section and thusly require a separate search tool. The comprehensive Timeshare Wish Ad Search Tool will provide the exact same functionality as the Timeshare Classified Ad search tool, but this of course will only show ads from users who want to buy or rent your timeshare! You can either Browse all Wish ads, or Filter your results just like above using the Timeshare Wish Ad Search Tool here. I hope this accurately explains how to post new ads, and view existing ads in the new Timeshare Classified Ad program for TUG! Any questions and or comments can be directed to tug@tug2.net and I will answer them within 1 business day at the latest! 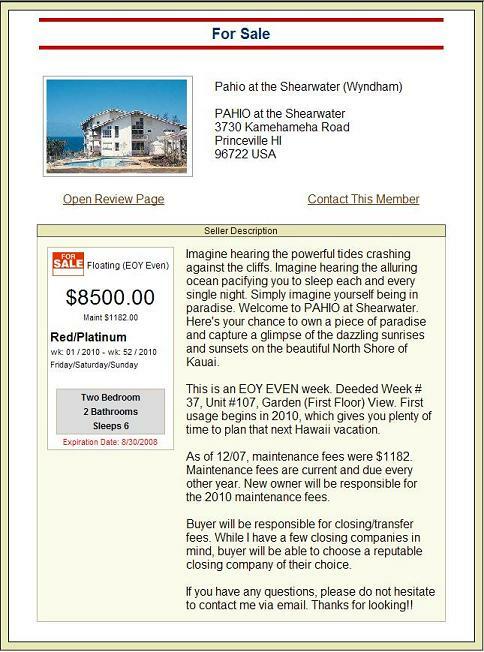 Screenshots for free timeshare classified ads!